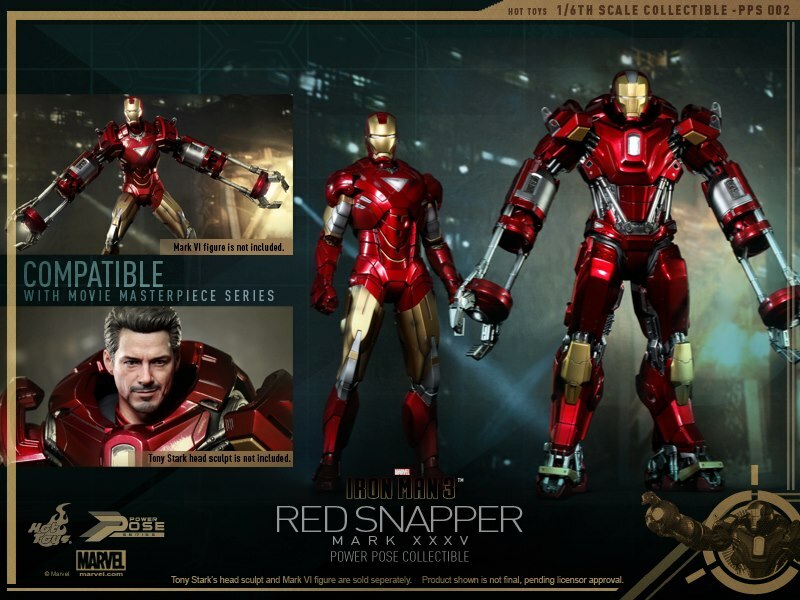 Fruitless Pursuits: Pre-Order Hot Toys Iron Man Mark XXXV Red Snapper! 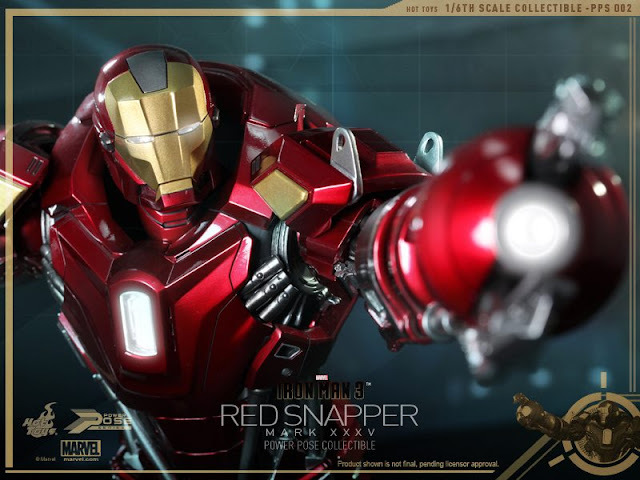 Pre-Order Hot Toys Iron Man Mark XXXV Red Snapper! 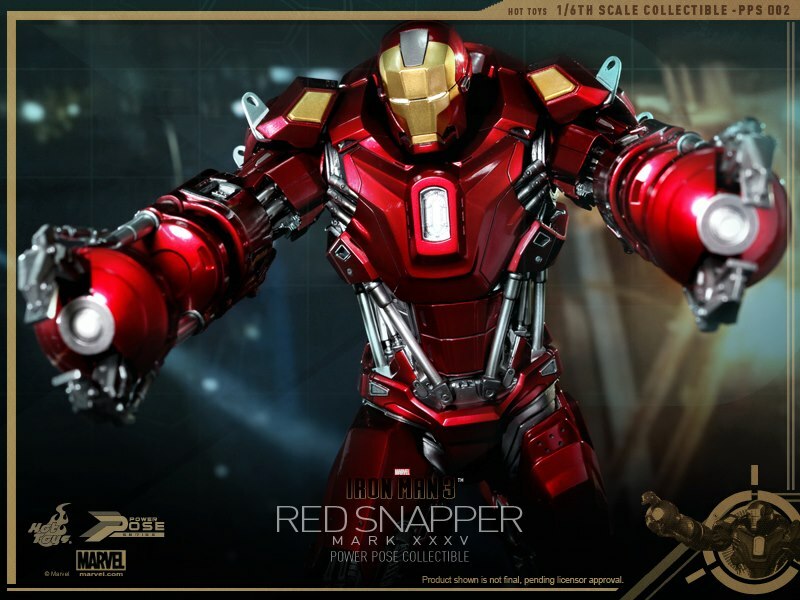 Red Snapper. It sounds like an unfortunate euphemism, but it's actually the nickname of the Mark XXXV, one of the billion new armours that Tony Stark has constructed for Iron Man 3. What is it's function? That I can't tell you. I guess I'll find out when I see the movie tonight, providing it doesn't glance by in a fraction of a second. Either way, it looks pretty cool. Or if you'd like to see more pictures, join me... after the jump! I'm talking about SPACE. How much goddamn space does this thing take up!? Where on earth are you going to put him? 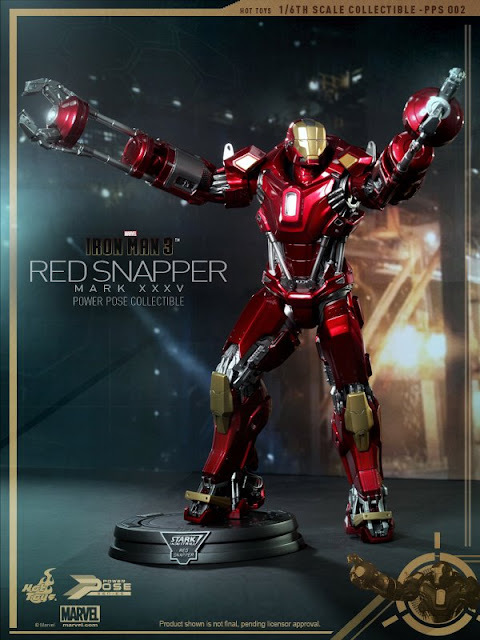 I'm assuming that, if you're in the market for a Red Snapper, then you are already a pretty big Iron Man collector with a collect-'em-all mentality. We're going pretty deep once we hit the XXXV. 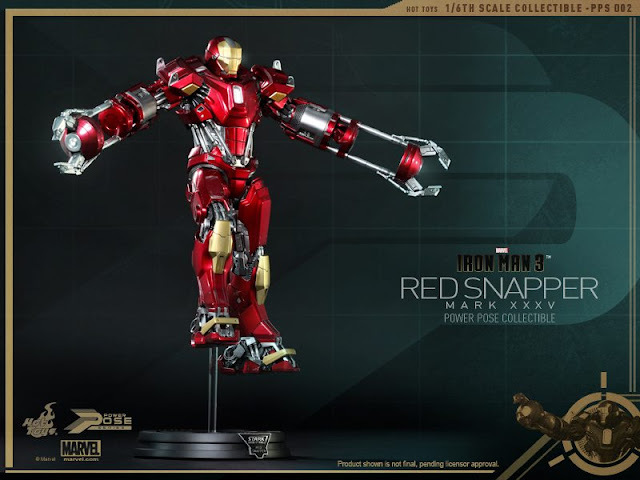 So assuming then that your shelves are already filled with Hot Toys and the like, then this guy is really going to command a lot of space. Good luck fitting him in your glass cabinet. Good luck fitting another figure next to him. Look again at that picture above. If you stand Thor and Cap on either side of him, not only are they going to need to be a foot away, but he's also going to look like he's gingerly jerking them off. I'm not saying that this should deter you, I'm just saying that this guy is going to need some dedicated display space, preferably on his own, and probably not enclosed. 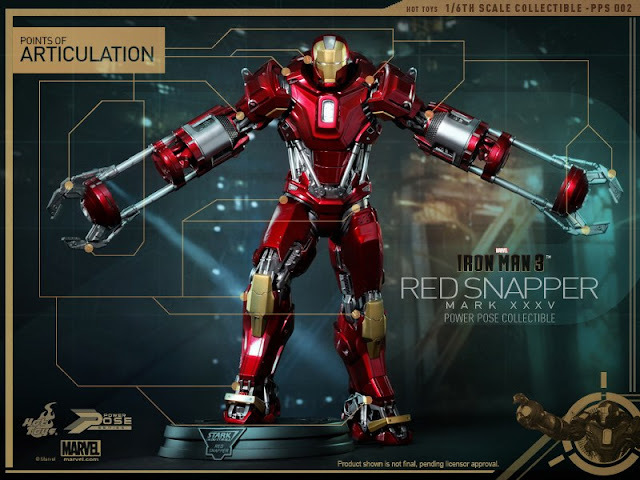 Now THAT to me is a great value add and if they make the Stark head fit on all of the upcoming suits then I'll be far more impressed. 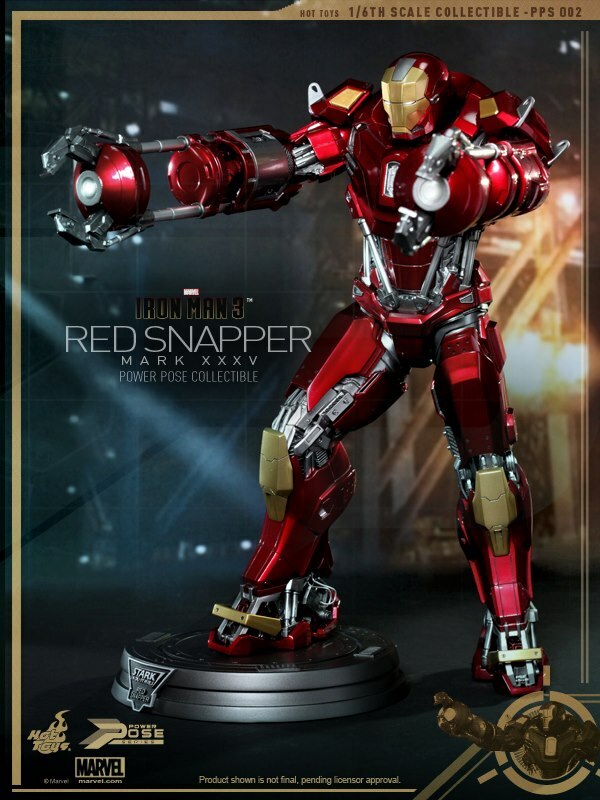 I have no issue with Hot Toys varying their lines, but keeping them all in-scale and compatible is a very smart move. Well played! Now I hear that two more suits are coming down the pipeline so stay tuned!